Plot: In the first game, you play as Commander Sheppard (male or female) – the first human to be promoted to the rank of Specter, which is an elite alien fighting force. Your mission was to stop a rogue agent from destroying worlds. Turns out he was working for (or being controlled by) a race called The Reapers. This race is so old, most other alien races don’t believe it exists…even when The Reapers start attacking the Citadel, where the alien counsel is housed. Through your decisions, you either save or destroy the counsel, and either defeat or drive off the Reapers. 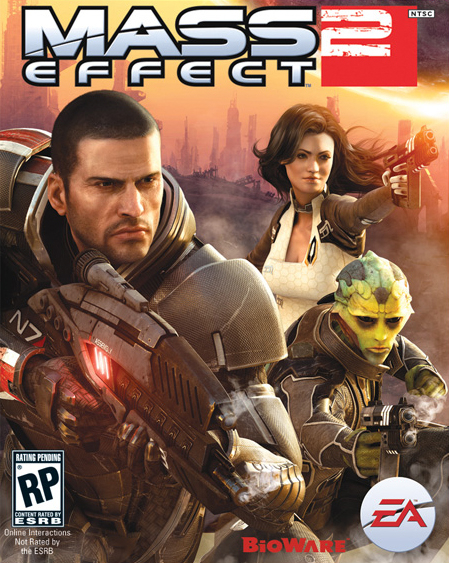 The first game is only available on Xbox or PC, but there is a summary interactive comic in the PS3 version of Mass Effect 2. The second game picks up with Sheppard flying around space, and suddenly his/her ship (The Normandy) is attacked by an unknown alien race. Rushing to save his pilot and friend, Joker, Sheppard is sucked out into space as the ship explodes. He/she dies. Two years later, you wake up in a lab having been completely rebuilt by a corporation called Cerberus, which has “humanities best interests at heart.” Someone called The Elusive Man has paid to have you rebuilt from scratch, and he wants you to assemble a team to figure out why human colonies are disappearing. As you progress in the game, acquiring new characters to add to your team roster, you also make important decisions that will affect the outcome of the game…and of the games to arrive later in the series. I knew this game would be fun. I’ve played the Star Wars: Knights of the Old Republic (KOTOR) games, which were a ton of fun. This game was no different. The entire time I was playing this game I was asking myself why someone hasn’t made a Star Trek game like this. The universe is expansive, the characters are dynamic and compelling, and the story is like an epic movie, with the serial feel of a TV show. Overall, this game is epic and amazing and you should own it. 2) Conversation trees that lead you through the interactions with NCPs (non-player characters) and team mates, which reveals their stories and also opens up new missions. Over the course of the game you become very close to your team, and even have the option of romancing one member (you can try for many, but ultimately there can be only one). The PS3 game also comes with all of the DLC (minus the final DLC pack, called “The Arrival”), as well as several bonus characters who I generally enjoyed. This game is massive and epic, which are two things that I really look for in a game. It also has an amazing story, some great characterization, and some very fun gameplay. Overall, there’s no reason not to like this game and play it from start to finish. And depending on how you play throughout can GREATLY affect the outcome of the ending of the game. Without giving away any spoilers, characters can die. And these are people you spend most of the game getting to know and start forging an emotional connection with. At least I did. And thankfully none of the characters died for me (except for the assistant, which I was kind of bummed about). 2) Renegades – which are people who are only focused on the mission, and nothing gets in their way. I played Paragon my first time through, and had an amazing experience with the story and character interactions. I did play a few scenarios as a Renegade, however, as I felt it fit my character and the situation. And that’s the beauty of the game – you can play either way. The benefit of playing one way over the other is you can unlock specific contextual events that make scenes play out differently. As far as gameplay goes, there are multiple classes you can play. Most players will probably go for the soldier class, which benefits guns over stealth or powers. However, I like to sneak around – so I played an Infiltrator, which has stealth abilities and can control robots for a time. They also have proficiency with sniper weapons, which came in handy during my play time. Playing as different classes may change gameplay and the way scenes play out – I’m not sure – but it definitely encourages multiple play throughs. And you’ll want to play this game over and over again. In summary, if you don’t already own this game (it’s been out for a while, and the 3rd and final Sheppard game is coming out early next year), you need to buy it and play it from start to finish. It’s amazing.